I think there has been an appreciable shift of opinion amongst fans of TRFC recently. Unlike the ‘invest: speculate to accumulate’ rhetoric featured in the press and by ex-players, the ordinary fans are coming to the realisation that there is no quick fix. There are even murmurings that there may never be a fix which involves their club becoming a competitive force. Poor management of fan expectations has long been an accusation levelled at the TRFC board by SFM. It is possible though that many fans are beginning to manage their own expectations rather better. There are certainly justifiable criticisms of the manager, Mark Warburton, but alongside that is a realism about the limitations and constraints that he is working under. There is a rather misguided, and possibly not accurate assumption that another liquidation for a team out of Ibrox would result in having to start ‘yet again’ in the bottom division; but in fact there is a growing acceptance that consolidation in the top league is a much better solution than gambling on huge borrowing simply to stop Celtic adding more notches to the goalpost. Could it be that the fans are about to do the job that the board haven’t had the balls to do –accept the gap between themselves and (at least) Celtic, and settle for mediocrity on the field as a short term price to pay for continuity? During the 1990s, in the middle of the Murray/BoS fuelled spending spree, and with Celtic in the doldrums, it seemed to many Celtic fans that their club would never be able to bridge that gap. Of course they did, but at the emotional cost of losing the exclusive 9IAR record. TRFC now find themselves in pretty much the same position, but their road to bridging the current gap is a more difficult one. There are similarities of course. Like the Celtic of the 90s, Rangers have major infrastructure challenges to meet. Celtic had a stadium to build, Rangers have Ibrox (and Auchenhowie) to fix and improve. Both required massive investment to improve the team, although I would argue that Rangers have a steeper hill to climb in that area. Unlike RFC of the 90s, Celtic’s accrued wealth has nothing to do with an intravenous hook-up between their bank account and the chairman’s pals at the bank. Their baseline advantage over the current Rangers predicament is a combination of a stadium which holds 10,000 more fans than Ibrox, no debt, a burgeoning cash balance and the current inflow of European cash. The Euro cash and the cash balance could be depleted, but the 10,000 extra seats won’t. The current chairman and vice-chairman are both directors of a previously liquidated club, and therefore associated with the financial mismanagement which brought that about. In that climate, sponsorship deals are hard to come by. Major sponsors want to be associated with stability, success and integrity. TRFC don’t tick many boxes in that regard. Banks do not lend to football clubs. Pre Murray/Masterton, football clubs were cash businesses with modest overdraft facilities to cover modest cash-flow peaks and troughs. The banks have returned to that model. 1987-2007 was the exception, not the norm. They are at war with a powerful and substantial shareholder in Mike Ashley. There is still litigation pending on more than one front which could even call into question the ownership of the club’s assets. They are in debt already (estimated at around £15m). The current onfield situation may require yet another write-off in terms of contracts. Any one of those bullet points could be enough to derail any plan to get to the top. In combination, there may even be an existential question to answer. That is why the fans are starting to look a lot smarter than the board, and ultimately the good sense of the fans may well help the board to find a way out of their current dilemma. But even with realistic expectations from the supporters, is it possible that they can find a way? Is there for instance someone with a magic wand or bag of cash who could come in and turn it around? Perhaps, but who would risk money on a precarious venture like a football club when one of the most powerful businessmen in the country is in dispute with you? Ashley has to be reconciled with the board (needs King and Murray to go). The debt has to be written off . The new investor(s) has to be given control of the club (and this would perhaps require another 75% special resolution where current shareholders would be asked to vote to dilute their own influence). If they achieved that (and it is a pretty big if) the new investor cash would go into the club’s bank account – not used to pay off the debt – and they would be free to pursue new and better sponsorship deals, improve the merchandising contract with an onside Ashley, and add new revenue streams. Even then, any new board would need to see the infrastructure challenges as paramount. Having one eye squinting in the direction of Parkhead will blur the bigger picture. Their priority should be to reduce the losses (whilst increasing wages for better players), fix the stadium and the training ground (both in need of repair and improvement), build a scouting and youth infrastructure, and free up a (relatively modest) wad of cash to improve the playing squad. In defence of the current board, the challenges facing them are almost vertical in incline. No matter how skilful they are, nothing other than someone with a barrowload of cash and a very long term outlook can put any kind of fix in place. £50m might buy the debt and equity, and repair the stadium, but progress requires on-field improvement. It also needs stability, and therefore Ashley’s cooperation. The price of that is the head of Dave King. Rangers will bring in more at the gate than Aberdeen, Hearts or Hibs, but they have a considerably higher cost base than those clubs. With better players, recurring costs will be even higher – much higher. To square this circle, however unpalatable it appears to be, peace has to be made with Ashley. That is the key to being able to embark upon a journey that has any chance of success. Otherwise, the clocks will have to be reset to 2022, and the end of the SD contract, before progress can be made. However there is no chance it can go on that long. Rangers fans may be increasingly less demanding in what they expect, but they will need to see some signs – and not just words – that a plan is in place. The board are getting ready to throw Mark Warburton to the hounds (the MSM lapdogs have already been armed with poison pens to effect that). This will buy them some time, but not enough. For Rangers to have a fighting chance of competing at the top of football, King needs to be gone. If he does go, half of the barriers preventing the club raising cash are dismantled. So is King’s departure a price worth paying? If he really had Rangers in his heart, he would say ‘Yes’. I often have a go at the SMSM but today’s article by Des McKeown in today’s Sun was well written (apart from the old firm part’s).But none the less the first journo spelling it out the way it is. You’re fine with that, arithmetic is thankfully free from semantics, it is definitive. Unless it’s statistics of course, which like valuation is closer to an art (or dark art) than a science. Your point is well made though. Calculating the tax is not as simple as taking 40% of the amount paid, if the amount paid is nett rather than gross. Taking a straightforward 40% of £60 would be £24 underpaid. That would make tax due 66.66% higher. So if someone had a £500,000 EBT the tax would not be £200,000 it would be £333,333 or thereabouts. That’s before adding interest at commercial rates from the time when the tax was due and any penalties for avoiding it in the first place. Oh and as you say NI if that’s due as well. You are probably looking at a bill of c£400,000 all told. But what great reading it has been! Not because any one of us necessarily has had his/her views and opinions and prejudices acccepted and vindicated. It’s never been about anything more than asking questions, legitimate questions, about the shocking demise of a huge football club, a monolith of a football club, a football club that was part of the very fabric of Scotland’s civil polity. It’s been about asking whether that huge football club owed its status in the decade or so before its death to nothing other than the vile cheating by one businessman of the other business men against whose businesses he was competing. And about asking whether our Football Authorities knowingly assisted that cheating , turned a blind eye to it, and made liars of themselves in order to defend it. RTC ( how I honour that person!) in his/her tweets ,which I have only just seen in full this evening [ 11.27 pm right now ] has turned out to be of the calibre of the Watergate guys in finding out actual facts. It was news to me that HMRC had formally , under the law, asked the SFA for information about a club which was clearly under suspicion in respect of its tax affairs. 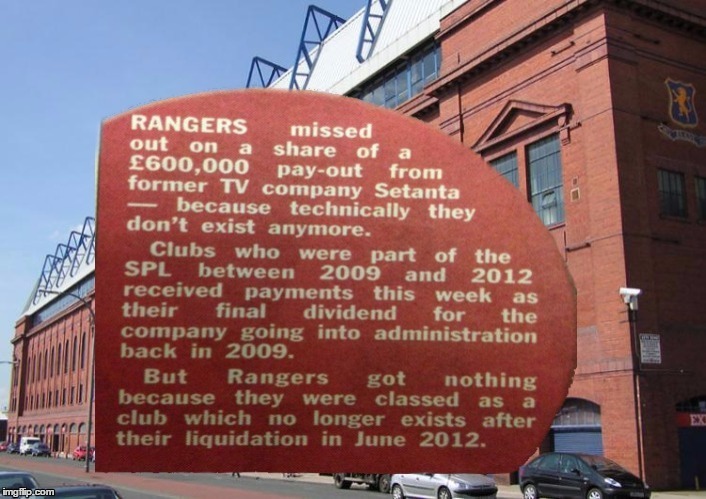 The fact that the SFA , alerted to the tax problems of the cheating RFC as they had been, allowed the cheating to go on. and on..and on is something that the SFA have to answer for. And they will, of course, one way or another, answer for it. All praise and honour to RTC( the person). And congratulations to him/her/it on being granted an Orwell scholarship! Better to read Phil, a man who can write. ‘ Midfielder Callum McGregor says being so close to sealing the title at this stage of the season is a “great achievement”, but insists, even if Celtic wrap up the title this weekend, the champions want to preserve their unbeaten record for the remainder of the campaign. “It’s that relentlessness to go and get there – it would be great to get over the line maybe this or next week,” he said. I have not met, nor am I likely to , meet ‘the manager’. If I were to meet him, I would tell him that there was not much in the way of ‘relentessness’ in the very, very poor performance against a piss-poor TRFC. I will say no more, except to remind myself of the reasons why the term ‘Old Firm’ was created by (perhaps) a slightly more journalistically honest breed of newspaper men in my grandfather’s time. Should it be decided that the players are responsible for their unpaid tax , and they then produce their letters of idemnification, would the debt become a problem for the old club (IL) or would it be a football debt to be fielded by RIFC ? I know there’s a few ‘ifs’ involved, but if it’s a football debt, and TRFC/RIFC couldn’t pay, then does that mean that David Murray in effect has doomed three Rangers not just one? – just too funny, and wonderful karma in my book. That would go in the old club column. Remember, for things they want – same club. For things they don’t – old club’s problem. Is the site broken then been a long time since the last post. The site isnae broken they’re aw oot. Remember the disruption at Ibrox when Mo Johnston was signed? The burning of ST books and scarves by the bears outside the Ibrox front door. In the SMSM it was bluntly portrayed as Minty / Souness finally breaking the club’s [archaic, discriminatory, and offensive] signing policy. You would think that this is even more significant than signing Mo. And a refreshing aspect for the new Ibrox club to shout out about : a clear signal that it is distancing itself from the old club’s baggage. And yet – unless I missed it – not a mention in the SMSM. I was out celebrating our 1 all win – apparently de rigour nowadays . My usual moan about the BBC. At the tail end of Sportsound today they demanded that Hearts publicly explain the relationship between the Director of Football and the Head Coach. Apparently Craig Levein was spotted passing notes to Iain Cathro at Pittodrie yesterday, as well as a rumour he was in the dressing room. Hearts fans can make up their own minds about how they think their club is being managed but quite why Willie Miller, Michael Stewart, and Steven Thomson think they have a right to know the inner workings of the club is beyond me. If Hearts were to release a statement tonight demanding to know confidential information from the BBC what would the answer be? Sorry, de rigeuer . Not quite sober yet ! Walter NeffMarch 17, 2017 at 18:17 Better to read Phil, a man who can write.———————————————But often not right! Since it’s quiet I’ll sort that and hopefully be more popular . (Has he disappeared by the way? Not had any of his “developing stories” recently). Cathro and Levein don’t have to explain themselves to anyone at this moment in time. The club has embarked on a DoF / Coach arrangement and it would be daft not to expect someone of Cathro’s limited experience not to have some discussions with Levein re playing matters. Whether that is behind closed doors or in the full glare of an ongoing match, who really cares. If you think about American Football, banks of coaches are constantly relaying information back and forth from the booths in the stands to the sidelines on the game and the required tactics. International rugby has gone down the same route and these days you generally see the head coach behind the glass of the coaching booth in the stands. Nobody bats an eyelid. How many of us have sat in stand and are clearly seeing faults and issues that we do not believe are being seen on the sidelines by more experienced coaches/managers than Cathro? The fact is that there is a body of Hearts fans who have little time for Levein and would happily see him go. My guess is that this is something they will happily grab and run with. The main problem is that whatever the football department as a whole are talking about isn’t working as the team on the park is blowing more cold than hot at present and yesterday there was a clear lack of fight against a hard working Aberdeen. Dropping to 5th spot is going to have fans asking bigger questions beyond the passing of notes between dug-out to stand. To be fair to the BBC Tam Cowan on ‘Off the Ball yester day did recall a time when it was rumoured SDM went into the Rangers dressing room to give the players a bollocking (possiby during the Le Guen period) and that this was of course portrayed, at the time, as strong leadership and all for the good of the club. bordersdonMarch 18, 2017 at 14:54Walter NeffMarch 17, 2017 at 18:17 Better to read Phil, a man who can write.———————————————But often not right!———————————–Since it’s quiet I’ll sort that and hopefully be more popular .But not often right. (Has he disappeared by the way? Not had any of his “developing stories” recently). and a new site will be open soon. UPTHEHOOPSMARCH 19, 2017 at 15:09You totally right.Cathro and Levein don’t have to explain themselves to anyone at this moment in time. I Don’t know whether you heard it or not, but I was genuinely surprised at how animated they sounded about it. It really was portrayed as a demand, not a comment. I don’t know what Cathro has done to upset them, but they have been on his case almost since day one. I suspect Levein is the type of character who has given them short shrift in the past. It all seems very vindictive to me, and in my view there has to be something beyond purely footballing reasons behind it. The same guys were utterly vicious about Ronny Deila last season while Mark Warburton was hailed as a genius. The revisionism about Warburton from them now is breathtaking. He is on the bad guys list. If When Rangers appoint a Director of Football you can be sure of one thing. He will be portrayed as a man of integrity, somehow better placed than all others to make comment on various issues. They certainly won’t have any issue with him going near the dressing room. Not that they will report it even if they know. Was babysitting today and was watching toy story and for some reason the sevco manager keep popping into my head and i realised i have seen this guy before. Only time will tell i suppose if he really is a lump of wood and the new toy to keep the gullibles minds of more pressing matters. At the Supreme Court I have to admit I was enchanted with the manner of Julian Ghosh’s speaking. Especially his pronunciation of the word ‘to’. t.
t the manor born – popular sit. com. Well done Julian. Good luck t you. I rest my case! Means f all! In referring to precedents I also liked the way they said ‘small’ c or d etc. We would now say lower case. Like small bobby madden as opposed to lower case bobby madden. Andrew Thornhill QC was declared bust after a petition by HMRC.THE barrister defending Rangers’ EBT scheme went bankrupt over tax debts days before the club’s case called. He surely didn`t take a punt and sign up for an EBT with Baxendale Walker after the first two wins ? which is probably our man. In the abstract ,since being declared bankrupt is apparently no bar to carrying on in one’s profession, what else would a chap, perhaps an expert in these matters, do but shed personal debt , first making sure that no one can legally claim assets that you have access to. Podcast tomorrow will feature Stuart Cosgrove on post-Armageddon Scotland, Pedro, referees, St Johnstone chasing third, and the increasingly intriguing championship race. 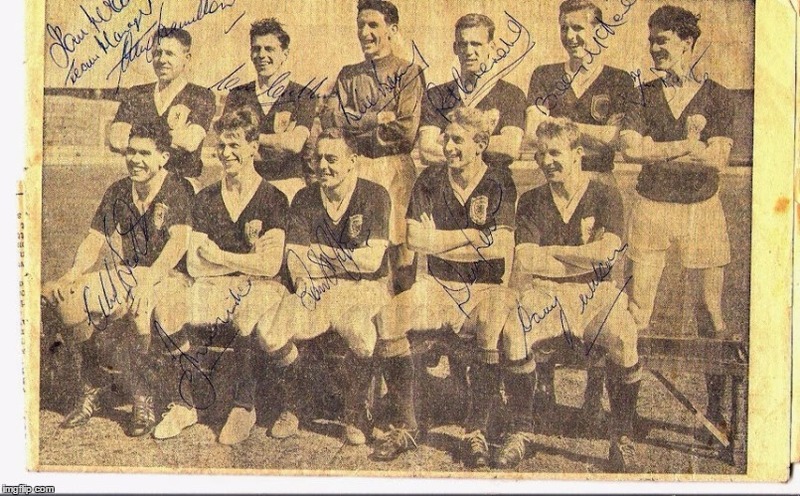 Some true legends there, …. if not all !!!! I know the oldco/newco arguement has been gone over many many times but the Sun online seems confused between the club and the “firm” (their word) in a piece on Mr Thornhill’s tax affairs. Is the “message” changing? From what we can see King is a serial financial offender whether it be SA tax , JSE regs or UK Takeover Panel regs – the guy is obviously prepared to act outwith financial regulations so why no SFA inquiry ? During his visit here this week surely Reagan will be requesting a meeting . The English FA refused to give approval to the Italian gentleman (forgotten his name) to takeover Leeds United because of a VAT problem on a speedboat purchase/sale from memory yet we get a proven financial offender ostensibly owning+operating a football club here – as they say “only in Scotland” . I suspect the SFA are taking the same line as they did when deciding that they didn’t have to consider if Mr King was “fit and proper”. He doesn’t actually sit on the board of TRFC Ltd, therefore is none of their concern. However that does beg the question, have they taken the board to task over him behaving as the de facto owner of the club with his statements etc. In fact did he not do a series of about 10 comprehensive “answers” to concerns the fans had. These “answers” were published on the official club website. In what capacity did he do that, people just assumed it was as Chairman / shareholder. There could not be a clearer instance of a shadow director, operating in full glare. Quite ironic really. Anyway, it is really the TRFC Ltd board the SFA should be dealing with and asking for clarity with regards Mr King’s position. They can’t have it both ways. naegreetinMarch 20, 2017 at 12:19 Re Dave King/SFA During his visit here this week surely Reagan will be requesting a meeting . I fear herein may your answer lie! It’s nearly my bedtime here in Queensland, after a day of incredibly , tropical rain ,battering down for ten or twenty minutes at a time, stopping as suddenly as if a tap had been turned, and beginning again a short time later as if the tap had been turned on again. But, I have to report that I have not yet received a reply from UKAD to my query to them of 15th February, and my reminder of 8th March,as to whether the SFA had ever received monies from them to help in th fight against doping. Nothing there, of course, on whether they paid any money to any organisation in particular. Just the usual self-congratulatory self-assessment of how wonderful they have been in fighting sports corruption, meeting their targets and such like crappy crap. But, and going a wee bit off topic, I was intrigued to see that the name of the Comptroller and Auditor General ( who audits arms-length-from-Government agencies) is one Amyas Morse. Those two names to me shout out ‘Integrity’. And Morse, of course, is the (fictional) quintessence of the incorruptible police officer. Oh, that the names of those in our Football Governance and in the Press and BBC in recent years conjured up such images of incorruptibility! But, as we know, the names of those bearing office or function in Football Governance, and those reporting on football, are forever to be associated with betrayal of Sporting integrity, of cynical mendacity, and necessarily, of a lack of personal moral worth. (One such name, coincidentally, was the name used by a detective in a popular TV series in which John Thaw ( ‘Morse’ in a more cultured series) starred. I had an idle moment, so I had a look at what they say about themselves in their annual report and accounts (have a read athttps://beta.companieshouse.gov.uk/company/09078008 ).Nothing there, of course, on whether they paid any money to any organisation in particular. Just the usual self-congratulatory self-assessment of how wonderful they have been in fighting sports corruption, meeting their targets and such like crappy crap. Its the first time I’ve noted that term being used in relation to TRFC. It’s an ever expanding lexicon. I’ll keep a weather eye out for other surreptitious synonyms. In fairness I had assumed that the earlier resignation declaration was a statement (or at least a blog in support of a soon-to-be-released statement) from 1872. Whilst I appreciate the niceties whereby the remaining Directors post resignation (essentially the ‘other side’ to this morning’s resignation statement) ARE now effectively club1872 and can therefore say what they like AS club 1872 it does serve to ostracise the resigned parties slightly, when their specific problem leading to their resignation was essentially board members allegedly going rogue. They could really do with an experienced PR hand about the place. Might I suggest honesty and integrity as much needed qualities far more valuable than any PR firm might supply? From the 1872 blog August 2016. A bit long but interesting. Going For 55 – A Season to EnjoyClub 1872 admin Alasdair McKillop5 August, 2016Our league campaign kicks off on Saturday lunchtime, with Hamilton Accies the opponents at a sold-out Ibrox. I can’t be certain, but I’d be surprised if any previous game against the Lanarkshire club was so keenly anticipated. A card display in the Sandy Jardine stand will tell all those watching that Rangers are ‘going for 55’ after four season out of the top flight. But is that objective being pursued more in hope than in expectation?There are plenty of reasons to approach the new season in an optimistic frame of mind. We know this Rangers team is capable of playing football of an excellent standard characterised, at its best, by swaggering control of the ball. The Scottish Cup final might have been a disappointing way to end the season but its significance in the grand scene of things it was minor. The accumulated performances of last season, including notable wins over sides from the division above, testified more accurately to the qualities of the team. That longer term perspective lends itself of a sense of buoyancy. Arguably, the squad has been strengthened over the summer with the likes of Nicky Law, Nicky Clark and Dean Shiels moving on and players like Joey Barton, Niko Krancjar and Jordan Rossiter coming in.The contest for midfield spots lots set to be fierce, with top performers from last season such as Andy Halliday and Jason Holt battling to retain their positions against the newcomers. This is the one department in which it feels like we have a luxury of dependable options. Doubts, albeit of differing severity, remain about our options at the back and up top. Our problems in defence are well chronicled and enough to bring on a cold sweat. In the centre, Danny Wilson and Rob Kiernan, the preferred pairing from last season, have yet to convince (so will they ever?) or convey that sense of solidity that’s so important in that area. Clint Hill has been brought in and his relatively advanced age evokes memories of the arrival of David Weir. He has so far started games in the Betfred Cup alongside both Wilson and Kiernan but it wouldn’t be surprising if the two younger players were the preferred pairing, at least in the early stages of the season. Mark Warburton has stated his desire to bring in another player for the position, with reports at the time of writing linking Rangers with former Arsenal player Philippe Senderos.Lee Wallace is under no threat out on the left but doubts remain on the other side where a tough cost-benefit analysis might have to be carried out on James Tavernier. His contribution in attack is remarkable, a real bonus, and something for other teams to contend with. But in the performance of his defensive duties he is less diligent. Given the step up, it would be reasonable to anticipate his positional weaknesses being exploited more often than they were last season. Lee Hodson has been brought in to provide cover and meaningful competition for places but if Tavernier contributes goals at the rate he did last season, and he has already opened his account with a classy finish against Motherwell, then it might be difficult to shift him. Of course, Tav’s forays could be more comfortably accommodated if we had a rock solid central pairing but…well, we’ve covered that already.In attack, Barrie McKay and Martyn Waghorn, two of the standout performers last season, will likely expect to be considered automatic first picks. It remains to be seen where Waghorn will be deployed as the manager looks to accommodate other attacking options such as Kenny Miller, Harry Forrester and the recently signed Joe Dodoo. Waghorn is arguably at his most effective though the middle, with other players able to offer more from a wide position and Michael O’Halloran might even come into consideration for a starting role on the right. A striker is Warburton’s other priority in the transfer market this summer but many fans would probably view such an addition as being less important than added fortification at the back. That being said, and at the risk of sounding churlish, there is a nagging sense that we aren’t quite as clinical as we might be when it comes to converting scoring opportunities. Maybe this is a distortion rooted in our regular dominance of possession, maybe is grows out of the unease that we won’t be able to rely on outscoring our opponents to compensate for frailties in defence. Dodoo might be the player to soothe those anxieties but another option is clearly being sought.On balance, the squad is better now than it was at the end of last season, even if certain longstanding problems remain to be addressed. But what does this mean for our chances of winning the league? Pundits and journalists don’t seem to believe the season will end with the trophy in the hands of Lee Wallace. A number don’t even fancy our chances of coming second, favouring either Hearts or Aberdeen for the runners-up spot. Both teams were strong last season and there’s no reason to think that won’t be the case again. But Celtic are not as far ahead as they should be given events of the last four years. In fact, it’s not clear they are ahead at all, a realisation that must churn in the stomach. In any case, Rangers fans need only think back to the predictions made before the Scottish Cup semi-final to recall how the consensus of experts can be trampled on by events.Being underestimated can be a powerful source of motivation. The club exudes a sense of determination and hunger can override the most careful analysis of relative strengths and weaknesses. We can take comfort in knowing we have a level-headed manager who knows his mind and a squad that’s as good as any in the league on its day (hi Joe Miller!). That being said, we might do well to remember that cliché intended to console children who lose out in competition: It’s not the winning that counts but the taking part. The past four years haven’t been erased by our return to the top flight so we should think back to the worst days and know that even the taking part wasn’t guaranteed. We could go further and note, maybe even take pleasure in knowing, that our presence is enough to aggravate some. We know and they know that 55 might not be landed at the first time of asking but it will come. I’m going to enjoy the season whatever happens. The best laid plans eh? Not exactly the hardest piece of writing to critically acclaim but a couple of points if I may. Firstly I think he’ll find it’s the Club, not the club, that exudes the hunger and determination. Actually, the daughter-in-law is not well, and we have come in very handy in looking after the grandweans and letting our son carry on working.Up and down all day with weans to daycare and school and back ,washin’ machine never aff, shopping to be done, meals to be made for all. Keeps us alert and fit, if thoroughly knackered! But extremely glad to be here.